Consecrated in 1627, the ex-convent of Saint Claire is now the seat of the of Artisan Brotherhood club (Fratellanza Artigiana). The church on the right was built later. 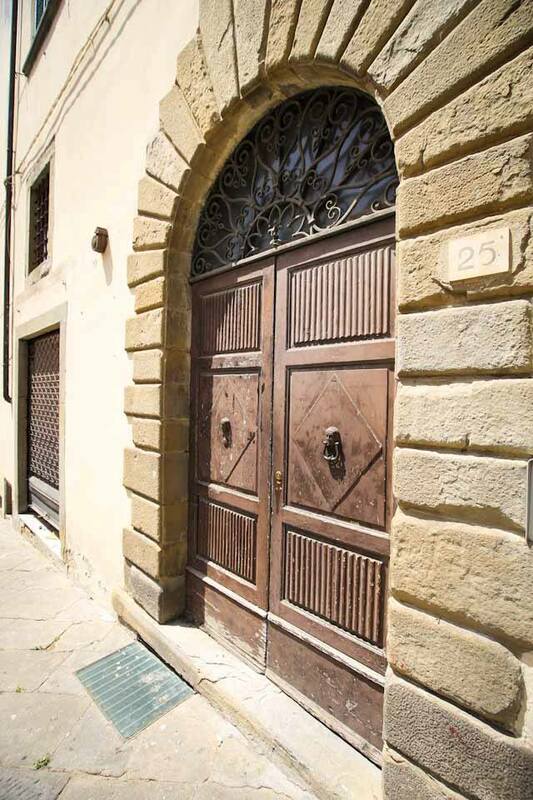 The entrance is located in Piazza Gamurrini, by the beautiful rustication portal. In March 1957, Silvio di Monte, priest of the Diocese of Arezzo and Canon in the Cathedral of Jesi, stated in his will the desire to build the convent of Saint Claire in his house, that had belonged to his uncle Pietro di Monte, Grand Master of Malta. It was probably restored by the Aretin decorator and painter Teofilo Torri, who turned this house in Monte San Savino into a convent. In a drawing of 1630, the building appears with two lines of half grated windows on the top floor and with a little bell tower of the former church of Saint Onofrio (or Saint Barbara) on the roof. The convent received the title of the Purification of Virgin Mary that substituted that of Saint Conception required by Di Monte canons because there was already another in the town in the convent of Benedict Nuns. They professed Saint Claire’s rule, following the Urban IV’s bull.